Jacques Bermon Webster II (born April 30, 1991, or April 30, 1992), known professionally as Travis Scott (formerly stylized as Travi$ Scott), is an American rapper, singer, songwriter and record producer. In 2012, Scott signed his first major-label deal with Epic Records. In November of the same year, Scott signed a deal with Kanye West's GOOD Music, as part of its production wing Very GOOD Beats, after appearing on the label's 2012 compilation album Cruel Summer. In April 2013, Scott signed a record deal with T.I. 's Grand Hustle imprint. Scott performing in February 2016. On May 3, 2018, Travis Scott released a single titled "Watch" featuring Kanye West and Lil Uzi Vert. The single was released as promotional material for his upcoming third studio album Astroworld. Astroworld was released on August 3, 2018 to critical acclaim, and debuted at number one on the Billboard 200. "Sicko Mode", the album's second single, peaked at number one on the Billboard Hot 100, becoming Scott's highest charting solo single. Scott was featured on five tracks of Metro Boomin's Not All Heroes Wear Capes. In December, Billboard reported that Scott was to make a guest appearance at the Super Bowl LIII halftime show during Maroon 5's set. 1 2 3 "Travis Scott Announces New Label "Cactus Jack Records"". HotNewHipHop.com. Retrieved 6 March 2017. ↑ "Travis Scott Plans To Lead New Label, Cactus Jack Records". vibe.com. Retrieved 8 March 2017. 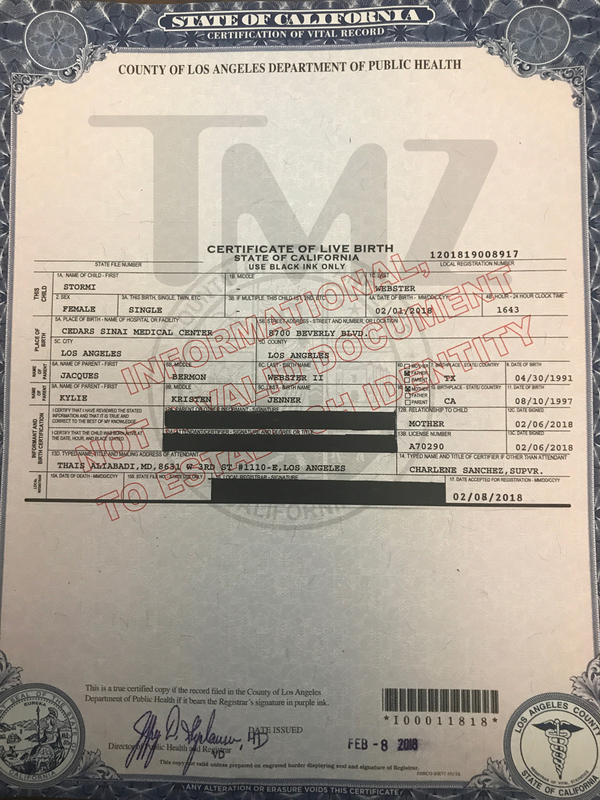 1 2 "Certificate of Live Birth: Stormi Webster". County Los Angeles Department of Public Health. Archived from the original on February 10, 2018. Retrieved February 19, 2019 – via TMZ.com. 1 2 "Travis Scott". AllMusic.com. Retrieved August 24, 2018. ↑ Kylie Jenner Asks Travis Scott 23 Questions. GQ. July 17, 2018 – via YouTube. ↑ "Who Is Travi$ Scott? – Growing Up in Houston". Complex. Retrieved October 3, 2012. ↑ "Who Is Travi$ Scott?Hating School". Complex. Retrieved 2018-02-04. ↑ "Travis is Scott talks about Growing Up in Houston". Retrieved October 3, 2012. ↑ Weiner, Jonah; Weiner, Jonah (2018-12-20). "Travis Scott: In Orbit With Rap's Newest Superstar". Rolling Stone. Retrieved 2019-02-04. ↑ "Mala Luna makes a great first impression". The Paisano. Retrieved 2019-02-04. ↑ "Travis Scott Discusses His College Rap Duo The Classmates In Unearthed 2009 Interview". Genius. Retrieved 2019-02-04. ↑ "Five things you didn't know about Kylie Jenner's 'baby daddy' Travis Scott". Metro. 2017-09-23. Retrieved 2019-02-04. 1 2 "Who Is Travi$ Scott? Moving to L.A." Complex. Retrieved 2018-02-04. ↑ "Who Is Travi$ Scott? (10/12)". Complex. Retrieved 9 May 2017. ↑ "Who Is Travi$ Scott?Meeting Kanye for the First Time". Complex. Retrieved 2018-02-04. ↑ "Travi$ Scott talks about working on Cruel Summer". Retrieved October 3, 2012. ↑ "XXL Freshman Class 2013 Cover Revealed - Page 2 of 2 - XXL". Xxlmag.com. March 27, 2013. Retrieved June 5, 2017. ↑ "Travi$ Scott interview with DJ Semtex". Retrieved April 12, 2013. ↑ "Urban/UAC Future Releases – R&B, Hip Hop, Release Schedule and Street Dates – ..." Allaccess.com. Retrieved 1 July 2016. ↑ "trvisXX: RT @ahmirxavie". Tmi.me. 2014-03-30. Retrieved 2017-07-18. ↑ "Travi$ Scott's 'Rodeo' Finally Has A Release Date". Retrieved July 16, 2015. ↑ "Travis Scott; Interview with DJ MoonDawg @ 9:35". Retrieved 26 April 2014. ↑ "Don't Play (feat. The 1975 & Big Sean) – Single by Travi$ Scott". iTunes Store. Apple. Retrieved March 24, 2015. ↑ "I Tried Not to Die at Travis Scott and Young Thug's Show last Night". Complex.com. Retrieved 1 July 2016. ↑ "Travi$ Scott's 'Rodeo' Rides to No. 1 on Rap Albums Chart". billboard.com. Retrieved 26 September 2017. ↑ Smith, Trevor. "Travis Scott in Wang Campaign". Hotnewhiphop. Retrieved February 8, 2016. ↑ Schwartz, Danny (2016-03-29). "Young Thug & Travis Scott Are Dropping Single In "Next Few Days"". HotNewHipHop. Retrieved 2016-04-07. ↑ Schwartz, Danny (2016-04-07). "Travis Scott Previews New Single With Young Thug". HotNewHipHop. Retrieved 2016-04-07. ↑ "Travis Scott on Next Albums 'Birds in the Trap Sing McKnight' & 'Astroworld'". Billboard. 2016-05-18. Retrieved 2017-07-18. ↑ "Instagram". Instagram. 2016-08-31. Retrieved 2017-07-18. ↑ "Instagram". Instagram. 2016-09-01. Retrieved 2017-07-18. ↑ Caulfield, Keith (September 11, 2016). "Travis Scott Scores His First No. 1 Album on Billboard 200 Chart With 'Birds in the Trap Sing McKnight'". Billboard. Prometheus Global Media. Retrieved September 12, 2016. ↑ "Travis Scott Signs Worldwide Deal With Universal Music Publishing Group". Hotnewhiphop.com. Retrieved 24 October 2016. ↑ "Travis Scott Says He's Executive Producing Kanye's Cruel Winter Album, Out Early 2017 | Pitchfork". Pitchfork. Retrieved 2017-06-05. ↑ "NBA All-Star Weekend will include free Pitbull and Travis Scott shows, 'Inside the NBA' live". For The Win. 2017-02-07. Retrieved 2017-02-17. ↑ "2017 Lineup - BUKU Music + Art Project | March 10 + 11, 2017 | NOLA". BUKU Music + Art Project | March 10 + 11, 2017 | NOLA. Retrieved 2017-02-23. 1 2 "Travis Scott Announces "Birds Eye View" Tour". Hotnewhiphop.com. 2017-03-05. Retrieved 2017-07-18. ↑ Sajonas, Felson (2017-03-06). "Travis Scott Birds Eye View Tour Dates and Cities Announced". Hypebeast.com. Retrieved 2017-07-18. ↑ "Travis Scott and Quavo Are Making a Collaborative Album, Preview Two New Songs". Xxlmag.com. Retrieved 2017-07-18. ↑ "Travis Scott and Quavo's Collaborative Hot Streak Is Undeniable". Complex.com. Retrieved 2017-07-18. ↑ "Travis Scott is dropping an album with Quavo from the Migos | Metro News". Metro.co.uk. 2017-05-17. Retrieved 2017-07-18. ↑ "Travis Scott Teases Quavo Collab Project and 'AstroWorld' Album in New Freestyle". Xxlmag.com. Retrieved 2017-07-18. ↑ "Travis Scott Teases 'Astroworld' and Quavo Project in Concert Freestyle". Complex.com. Retrieved 2017-07-18. ↑ "Drake – Chart History: Hot 100". Billboard. Prometheus Global Media. Retrieved March 29, 2017. ↑ "Kris Wu Teams Up with Travis Scott for 'Deserve': Listen". Billboard. Retrieved 2017-10-24. ↑ 1, Beats (7 Dec 2017). ". @zanelowe: "Does it have a title?" @QuavoStuntin: "Huncho Jack, Jack Huncho" Quavo says his project @trvisXX is being mixed. Hear more:". @Beats1. Retrieved 2017-12-09. ↑ "Travis Scott Chart History". Billboard. Retrieved 2018-02-04. ↑ "Quavo Chart History". Billboard. Retrieved 2018-02-04. ↑ "2018 Preview: Travis Scott on Redefining Rap and Why He Still Hasn't Gotten His Due". Billboard. Retrieved 2018-02-04. ↑ "Travis Scott's 'AstroWorld' Is Slated To Be Released In The First Quarter Of 2018 | The Source". The Source. 2018-01-06. Retrieved 2018-02-04. ↑ Michelle, Kim; Minsker, Evan (May 4, 2018). "Travis Scott, Kanye West, Lil Uzi Vert Drop New Song "Watch": Listen". Pitchfork. Condé Nast. Retrieved May 9, 2018. ↑ Legaspi, Althea (May 4, 2018). "Hear Travis Scott's New Song 'Watch' featuring Kanye West, Lil Uzi Vert". Rolling Stone. Wenner Media. Retrieved May 9, 2018. ↑ Yoo, Noah (July 30, 2018). "Travis Scott Confirms New Album Astroworld Out This Week". Pitchfork. Retrieved July 30, 2018. ↑ Caulfield, Keith (August 12, 2018). "Travis Scott's 'Astroworld' Bows at No. 1 on Billboard 200 Chart With Second-Largest Debut of 2018". Billboard. Retrieved August 12, 2018. ↑ "Travis Scott Chart History". Billboard. Retrieved October 14, 2018. ↑ "Metro Boomin Grabs Travis Scott, Young Thug, Gunna, & More For "Not All Heroes Wear Capes"". HotNewHipHop. November 2, 2018. Retrieved November 2, 2018. ↑ Brooks, Dave (December 20, 2018). "Travis Scott to Perform at Super Bowl With Maroon 5". Billboard. Retrieved December 20, 2018. Billboard can confirm that the "Sicko Mode" rapper will make an appearance during Maroon 5's set at Mercedes-Benz Stadium..
↑ "Travi$ Scott". Xxlmag.com. Retrieved 1 July 2016. 1 2 ALexis, Nadeska (June 25, 2013). "TRAVIS SCOTT SETS IT STRAIGHT: 'I'M NOT HIP-HOP'". MTV News. Retrieved October 18, 2018. ↑ "Travis $cott, Owl Pharaoh (Grand Hustle/Epic) SPIN". Spin.com. Retrieved 1 July 2016. 1 2 Reynolds, Simon (2018-09-17). "How Auto-Tune Revolutionized the Sound of Popular Music". pitchfork.com. Retrieved 2018-10-05. ↑ Miguelito (June 5, 2017). "From T-Pain to Travis Scott: The Rap Auto-Tune Spectrum". DJBooth. Retrieved October 18, 2018. ↑ Quinones, Zach (August 14, 2018). "Millennials Have Found Their Dr. Dre and His Name Is Travis Scott". Medium. Retrieved October 18, 2018. ↑ Fagen, Lucas (October 22, 2016). "Travis Scott's Ambience". Hyperallergic. Retrieved October 18, 2018. ↑ Guan, Frank (September 25, 2017). "A Beginner's Guide to Travis Scott". Vulture. Retrieved October 18, 2018. ↑ Brown, Eric Renner; Brown, Eric Renner (2018-11-12). "Travis Scott's Next Album Might Be a Broadway Musical". Rolling Stone. Retrieved 2018-12-08. ↑ "Travis Scott Wants to 'Design a Whole Play' for a Broadway-Inspired Album". Complex. Retrieved 2018-12-08. ↑ HopkinsOctober 8, Anna; 2018. "Travis Scott Wants to Be in a Broadway Musical - XXL". XXL Mag. Retrieved 2018-12-08. ↑ Iasimone, Ashley (September 22, 2017). "Kylie Jenner & Travis Scott: A Timeline of Their Relationship". Billboard. Eldridge Industries. Retrieved May 9, 2018. ↑ "US reality TV star Kylie Jenner gives birth to baby girl". BBC. February 4, 2018. Retrieved May 9, 2018. ↑ Pasquini, Maria (February 4, 2018). "Kylie Jenner Welcomes 'Beautiful and Healthy' Baby Girl". People. Meredith Corporation. Retrieved May 9, 2018. ↑ "2013 BET Hip Hop Awards: The Complete Winners List". Mtv.com. Retrieved 24 October 2016. ↑ "BET Hip Hop Awards 2015 Nominations: Drake Leads With 12 - Billboard". Billboard. Retrieved September 18, 2015. ↑ "Who Will Be The 2015 EMA 'Artist On The Rise'? Vote Now!". MTV. October 20, 2015. Retrieved October 10, 2016. ↑ "And the Nominees Are". Bet.com. Retrieved 24 October 2016. ↑ "MOBO Awards 2016 nominations announced: Find out who made the shortlist". Glasgow Live. September 21, 2016. Retrieved October 10, 2016. ↑ "Teen Choice Awards 2017 Reveal "Second Wave" of Nominations". E! Online. July 12, 2017. Archived from the original on July 12, 2017. Retrieved July 26, 2017. ↑ "Solange, Bruno Mars Lead 2017 Soul Train Awards Nominations". Billboard. October 17, 2017. Retrieved October 18, 2017. ↑ "NAACP Image Awards Nominees". Deadline. November 20, 2017. Retrieved January 6, 2018. ↑ "Rihanna, Ed Sheeran & Bruno Mars Lead iHeartRadio Music Awards 2018 Nominees". Billboard. January 10, 2018. Retrieved January 12, 2018. ↑ "Drake Leads 2018 BET Hip-Hop Awards Nominee Slate: Exclusive". Billboard. Retrieved 2018-09-13. ↑ "Travis Scott - Nominations". National Academy of Recording Arts and Sciences. Retrieved December 10, 2018. ↑ "Travis Scott Announces "Rodeo" Tour With Young Thug & Metro Boomin". Hotnewhiphop.com. 2015-01-27. Retrieved 2017-07-18. ↑ "Kendrick Lamar Announces 'The DAMN. Tour' with Travis Scott & D.R.A.M." Rap-Up. 2017-04-24. Retrieved 2017-07-18.